Our story begins in the early 80's when father Marcel took an interest in bees while sitting in the garden. Shortly after that he purchased his first beehive. What initially started as a hobby, soon grew out to become a well known and respected bee farm by the name of "Bij Dingens". In these early days, lots of people came to buy a jar of pure honey. After a while we also started to harvest pollen and Royal Jelly. It wasn't until the late 80's that Marcel read an article about powers of Propolis and took a great interest in this amazing bee product. In the early 90's, the production of a whole variety of Propolis products was a fact and took a very fast and high flight due to the overwhelming reaction of our regular customers. It still took about two years of prospecting before a few health food stores showed interest to sell our products. After about an other 2 years, the wholesaler "Marma bvba" took up the whole line of our Propolis products. From that moment it all went very fast. Within one year we got national reputation. Today you can buy our products in almost every Health food store in Belgium. After receiving national reputation we looked for further expansion of the company. We looked to our neighboring countries the Netherlands, Germany and France but international expansion is still going very slow. In 1997, the oldest son Rudy spent a year in the USA participating in a cultural exchange project. During a visit to their son, Marcel and Octavie where very attracted to the natural beauties of this continent. It woke an old dream they once had to go live in Canada. Only a few years later, they eventually took a very big turn in their lives and decided to move to Canada. Retired from his teaching job and both sons moved out of the house, Marcel and Octavie finally saw the opportunity to realize that old dream. It was also a perfect chance to expand the activities of their business. The youngest son Tony, who was already active in the company for several years, took over the management of the company in Belgium. Rudy, unfortunately oversensitive to bee-stings, active on the World Wide Web continued to take care of publicity. So, the whole family separated but were still all working for the same compagny. On October 17th of 2000, Marcel and Octavie arrived in Canada. The place to live was decided to be the eastern part of Canada, New Brunswick. The first few months were not easy. And of course, get the business started. One of the main ingredients they needed was of course raw Propolis. It was not an easy job to convince the first beekeepers in New Brunswick to start collecting raw Propolis for us. But we managed it. - Eventually, on Jan. 6th 2001 we sold our first Propolis product at the Farmers Market in Moncton NB. - On Jan. 27 2001 we delivered our first Propolis order to Staples drug Natural Pharmacy. - On Feb. 17 2001 the company Olivier started a new production line skin care products with addition of our Propolis. 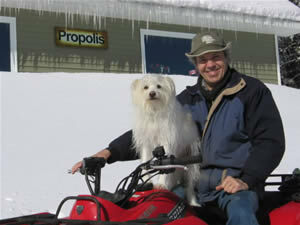 - On March 22 2001 we delivered Propolis to the first Health food store in NB. - In March 2002 the first Canadian beekeeper sold our Propolis products at the Farmers Market in Halifax NS. - On June 28 2002 the first Propolis delivery left Canada direction Taiwan, our first step in export. - On April 2010 Olivier Sopery became interested in our products and ? ? The next step will be to find a wholesaler to distribute all over Canada and in a later state to export to our neighbour, the USA. Compared to Belgium and Europe, here in Canada, the knowledge of Propolis by the general public is still very young. It is a market that still has a lot of growing to do. But the acceptance of the people and even the medical and pharmacutical world towards alternative medicine and healthy live styles is growing too. That means the golden years still have to come.